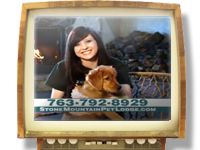 Take a video tour of our facilities and get a visual representation of why Stone Mountain Pet Lodge is Minnesota's premier pet boarding, grooming and training destination. Our third TV spot features our Pet Taxi service and highlights the five main components of our business: Lodging, Grooming, Training, Retail and Doggy Day Care. Our Family Taking Care of Your Family! View our 30 second spot from 2010, featuring our Pet Taxi and highlighting the five main aspects of our business: Lodging, Grooming, Training, Retail and Doggy Day Care. Going out of town? Let your pet vacation with us while you're on vacation! Our first venture into TV advertising was a 30 second spot on KSTP 5 featuring our original Pet Taxi and highlighting the various departments of our business. Chester and Stone Mountain Pet Lodge hosted the 2008 Twin Cities Disc Dog Championships. Check out clips of the acrobatic dogs and creative routines! Visit our friends at the Twin Cities Disc Dog Club for more information on the club and what they do and to see the results of the competition. 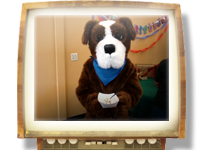 Chester celebrates his birthday at Stone Mountain Pet Lodge! What fun and exciting activities does he have planned for his special day? Watch and find out! Four trainers from Headwaters Canine Training competed at the CPE Agility Trials in Isanti, Minnesota. This video showcases their performances. RPAW (Rescued Pets Are Wonderful) held a Walk For The Animals at Stone Mountain Pet Lodge. Being the kind hearted pup he is, Chester signed up right away. 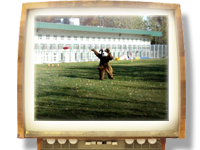 Chester takes his best shot at the agility training course at Stone Mountain Pet Lodge. Will he make it through? Watch this video to find out. Chester spends a day at the Minnesota Sate Fair. What type of people and things will he run in to?